Well, I guess that’s a wrap. I officially ended my undergraduate career last Wednesday and have been launched into the real world (i.e. : my mom’s house). With a full time job looming ahead and the tensions that inevitably arise from moving back in with my mom, just after a few days I’m slowly but surely missing college more and more. Knowing it’s going to be strange this fall when I watch everyone around me pack up and move back into their college towns, I want to give some advice to those of you lucky enough to still be in that stage of your life, or if you’re even luckier and you’re just starting it. 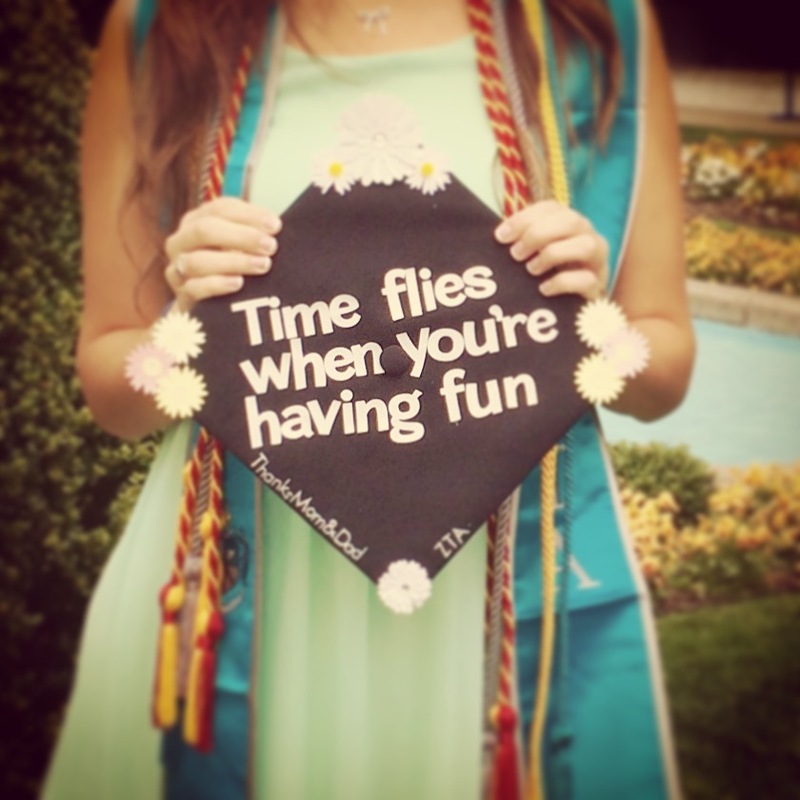 Here are 20 pieces of advice I learned from my fabulous four years in college. 1. Living in the same suite with your Resident Assistant isn’t that bad. The fun nights you had planned don’t have to end because your dorm is close to the RA’s. You could end up being best friends, just be careful and feel out the situation before playing kings in your common room (sorry Nina). 2. Take advantage of all the free stuff your school ID can get you. Seriously, go to those basketball games with free food and free T-Shirts. Go to the local food places that give you discounts with your school ID. And for the love of God do not take advantage of the dining hall. What I would do for a meal swipe right now. 3. Don’t be close minded to getting involved. Whether it be Student Government, Activities Board, Intramural Sports, or Greek life, just get out there and do something. Being part of a group or club is great, and whatever you may chose don’t judge others or stereotype those who make different choices than you. Find what fits you best and know it may not fit for your roommate, but that’s okay! You can be a part of different organizations and still be friends. 4. Go out. On the weekends, on a Tuesday, during the day. After college, going out on weekdays are no longer a thing. At all. Even if you aren’t into the party scene, go out and spend time with your friends. Go to the movies, go bowling, go to the mall even when you have no money. Have fun and make plenty of mistakes (how else will you learn?). 5. Get a job on campus. Ninety percent of my homework or studying was done while getting paid at my on campus job in one of the academic departments. This extra cash was key in getting through and really helped get my work done. Not to mention, my professors were all around me in the department so I could pop in and ask for help. 6. Start with gen-eds. No matter what major you end up in, you need the general education classes. I switched my major back and forth twice, then declared a double major for a semester, before finally deciding what degree I wanted to graduate with. Try a few intro classes before you commit. What you go in thinking you want to do will more than likely not be the exact thing you want to do when you leave. 8. Find what your passionate about. College isn’t just about going to class and getting a degree. It’s about your experiences. Try something new and find what you love. There’s so many more events that go on at your college that you probably don’t even know about. Even if you hate it and leave early, at least you tried. And who knows? Maybe it’ll bring you to some new experience or new friends. 9. One bad grade won’t kill you. Almost everywhere you apply after college will look at your GPA, not your transcript. As long as you aren’t consistently doing poorly in all your classes, you will be fine. Don’t panic at the first bad grade you get, just do better to bring up your overall grade. 10. Your roommates will become you’re everything. Find good ones. You don’t necessarily have to live with your freshman year ones all four years, but make sure you will be happy with your living arrangements. Who else will be there to tell you if you look fat, eat meals with, go out with, share clothes with, go to the gym with, and let you in when you lock yourself out for the tenth time? 11. Don’t skip class. You have all the freedom in the world now. But that means your professors aren’t going to baby you. You will lose points for participation and when it comes time to study for the final you’ll realize you are missing a chapter’s worth of notes. I’m not saying you should get a perfect attendance award at the end of each semester, but be smart about it. Also, tuition is expensive. Don’t waste it. 12. Make a difference. I was a part of an organization that participated in many different charity and philanthropic events throughout the year. I was lucky enough to become the Director of Philanthropy one semester and raised over a thousand dollars for breast cancer awareness and education. One of my best friends was chosen as an executive director for a dance marathon at her college for childhood cancer and was able to help the school raise over a million dollars to help find a cure. Nothing will be as rewarding as making a difference in other people’s lives. 13. Go on Spring Break. Anywhere you can, just go at least once. Find some friends and go away, whether it be a road trip to a town you’ve never been, a Carribean paradise or backpacking across Europe, just get out and go. Trust me on this, you’ll thank me. 14. The gym is free, take advantage! You need to counter the two am pizza somehow, and wouldn’t it be so much better to go back to your hometown for the summer and be the person who LOST weight at college instead of the freshman fifteen victim? Be smart, this is the only time in your life you will get a gym membership for free. 15. Don’t post your grades on Instagram. Maybe this is just my personal preference, but I think your 4.0 GPA loses its value when you shove it in everyones’ faces. Send a picture to your family, hang it on the fridge, be immensely proud of yourself, but do not post it on social media. 16. Boys are not everything. Do your own thing, have your own friends, and make your own memories. If it involves a significant other that makes you happy, that’s great! But if you don’t have one, you don’t have to go searching. And better yet, if there’s one in your life who makes you anything but happy, ditch ’em quick. Don’t let your significant other tell you what you can or can’t do, and certainly don’t keep one around who’s a jerk. College is your time and no one else’s, and you don’t want to waste one second of it with someone who’s no good for you. 17. Prepare yourself for the real world. Although you should be having the time of your life and enjoying yourself, you do need to be thinking about what is going to go on your resume and the best ways to set yourself up for a good future. Take advantage of your resources. Visit the career services center. They can help you with your resume, interview skills, and have all the connections to open jobs and internships. When it comes to internships, do more than is just required and start early. Wouldn’t it be nice to know before the last semester of your senior year that you actually hate the job you thought you were going to love within your field of study? 18. Visit your friends at their schools. Going to college doesn’t mean losing touch with your home friends. I had some of the best times in colleges when I was visiting my friends schools too. It’s nice to change it up and see how they do it different places. 19. Be your own person. Don’t fall victim to the stereotypes and don’t miss out on things you want to do because your friends or roommates aren’t doing it, too. Find your own interests and passions. Be friendly to everyone, even though that girl in your class is a friend of a friend of a girl your roommate hates. Don’t forget to always strive to stand out in a crowd and not to turn into a clone of everyone around you. 20. Take more pictures than you think you will ever need. The memories will seriously be what you hold onto the most after college (your diploma will be a close second). Don’t forget that girl you knew freshman year but transferred, that party you went to when your friend fell down the stairs, the event you planned to raise money for charity, that night when your roommate dropped a jar of Queso dip in the common room, or the friend you made because she ran out of the library research session the morning after a night out. Each one of these things, even the smallest insignificant ones, will be what you think back about and remember your time in college by. So take as many pictures as possible, because it really is the greatest four years of your life.